Stay informed of the latest news and specials. It was also an amazing year for diving and our return trip to the Galapagos Islands was even better than our previous trip in 2014! e look out towards Darwin Arch less than 1km away, just down the coast we can see a mother Humpback Whale teaching its baby to slap its tail on the surface, around the boat we count 6 turtles relaxing on the surface, 7 Silky sharks are swimming under the boat, then suddenly a school of Mobula Rays are jumping into the air as they swim past, and the biggest school of dolphin any of us has even seen is in the distance leaping and playing as only they can… this isn’t over the morning – this is all at the same time! To say we were excited to get in the water was the biggest understatement you can imagine… we were all buzzing to get under Darwin Arch! Click here for the first batch of pictures we've managed to sort through! Heading out towards the arch on one of the two inflatables – our boat driver suddenly yells out “Whale Shark right below us... get ready to go” heart racing gear in place camera in hand, “3, 2, 1, go as the inflatable slows down ahead of the whale shark – we backward roll in – I'm lucky – I'm at the front of the RIB and manage to swim ahead and slowly let her catch up to me and we’re only 3m below the surface! I angle to be above her and swim to get into the pressure wave above her head… always mindful of never touching – and manoeuvring so I'm in the sweet spot. I don’t have to fin as hard – I'm being pulled along with her – it feels amazing, I quickly look back and a couple of divers are still swimming trying to keep up – the others have peeled off towards the arch. She angles down and takes me on a 9-minute swim to 30m – several Giant Trevally come and join me above her head… they don’t stay long as almost unbelievably she swims through a school of hammerhead sharks!Truly one of the most epic moments I've had underwater in my 36 years of diving! She turns – I'm trying to remember to take pictures but I don’t want to waste this experience looking through the lens… she starts to ascend – too quickly for me to safely stay with her… so I peel off to the side – making sure the Go Pro on top of my camera captures her disappearing up into the blue shallows around the arch… she’s gone – I turn to high five the others (if they're still there) and a second whale shark is 4m away swimming straight towards me! I move up above and out of the way and let her pass underneath me and I swim on her back for the next couple of minutes and realise just how lucky I've been on my first dive at Darwin Arch – and that was just the first 15 minutes! Over the seven days we’re on board Galapagos Aggressor we swim with hundreds of Hammerheads, Turtles, and many more Whale Sharks – not to mention the Seals, Sealions, Marine Iguana, Sunfish, huge schools of Barracuda – this really is scuba diving heaven… We climb an extinct volcano and get incredible pictures of the wild landscape, we visit the giant tortoises and tour around finding penguins. We eat great food, drinks, and have some late nights playing our new favourite dice game “Zilch” (thanks Willie). This made for another epic trip at what we believe is the greatest big fish dive in the world – Darwin Arch - Galapagos… And yes, we've booked the Galapagos Aggressor for August 2021! Contact Malcolm on 09 444 7698 to book your spot(s)! 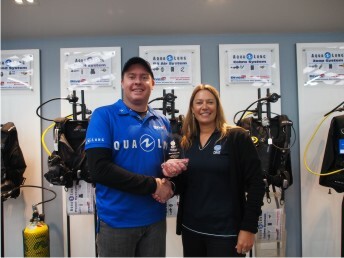 We were very proud to recently receive the shop award from PADI Asia Pacific in recognition of "Outstanding Contribution to the Diving Industry". Jen Clent PADI Regional Manager for New Zealand presents the award to Malcolm Kidd - MD Dive Centre Ltd.
At the same time Jen also presented Matt Shortall, Dive Centre's long serving Instructor with the "Outstanding Contribution to Diver Training Award" due to his consistent excellent work and issuing almost 200 certifications last year! 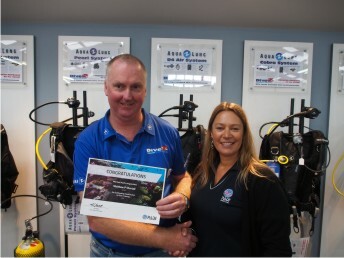 Jen Clent PADI Regional Manager for New Zealand presents the award to Matthew Shortall - Dive Centre Ltd Master Instructor. 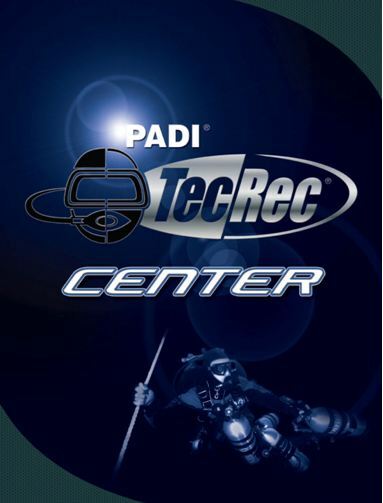 We also became New Zealand's first PADI Tec Rec Training Centre! Offering a wide range of Technical, Deep, Mixed Gas and Solo Dive courses - Phone Matt Shortall for more info on 09 444 7698 now! Go deeper and longer than you ever have before! 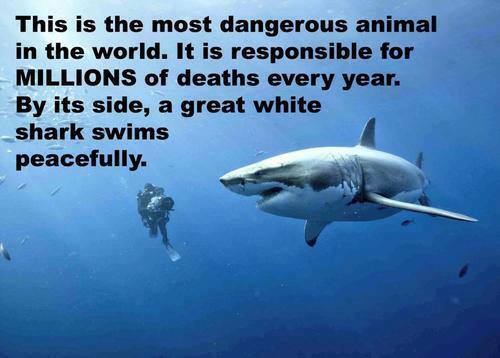 We are open 7 Days throughout the year except Public Holidays - We have to go Diving sometime! 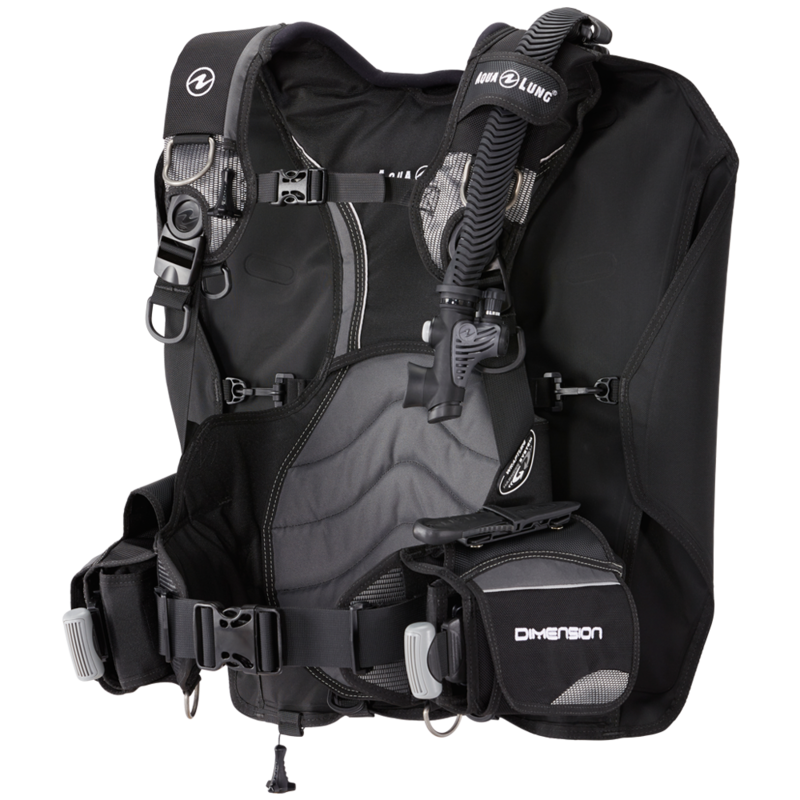 Massive Dive Centre Reg & BCD Clearance Sale on now! Faber 15L cylinders only $399 incl Valve! 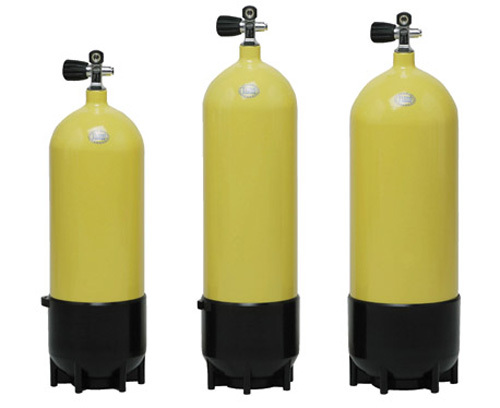 Faber 12L cylinders only $389 incl Valve! Now is the time to buy your scuba equipment – Never to be repeated prices! - only models & sizes in stock - first come first serve! Dive Centre Ltd is New Zealand's longest running dive company. We are an independant, family owned and run dive store. We have a huge range of the latest top quality equipment on display at our 6,000 sq ft Mega Store, we are the biggest PADI trainer in NZ, and with 6,000 sq ft of facilities dedicated to making sure you have a great time underwater, we are your one stop shop for all your Aquatic adventures - whether it's snorkelling, freediving, scuba or technical diving - but it's not only about size and range, it's about people you can trust! Dive Centre Ltd has been owned and run by the Kidd family since 1972. We have assembled an unmatched team of dive professionals whose passion is to make sure you are looked after and have a great time while learning to dive! We remain dedicated to ensuring you have the ultimate dive experience, offering the biggest range of services, the best advice on anything related to diving, and the largest selection of "quality" dive equipment on display in NZ. We stand behind everything we sell and do, and we will not be beaten on price for the gear we sell! Exaggerations are everywhere on the web, with every company you look at saying they're the biggest or the best. When you walk into our showroom, you'll know. You can also check out New Zealand Fishing regulations, and make sure you know your limits! New Zealand's home of Aqualung, Suunto, & SeaQuest! We have sold more Aqualung Regs, Suunto Computers, and SeaQuest BCD's than anyone else in NZ, we are "The Aqualung Experts" because our family has been selling Aqualung since 1972, we are one of the longest running Aqualung family dealers in the world! Visit NZ's biggest, and longest running store and see why Aqualung is the biggest brand on earth, and the longest running dive company in the world! And now the world's biggest brand - at the cheapest prices ever!! Massive price drops on the biggest brand on earth... Aqualung! With HUGE reductions on all Aqualung equipment (BCD's, Regs, right through to Masks and snorkels! ), it is now the same price if not cheaper to buy the world's biggest brand from us in New Zealand than websites overseas! There's never been a better time to upgrade your tired BCD or Regulator. You can now have Aqualung, and pay the same amount as a brand you've never heard of. Don't be dissapointed with "Bad Performance dive gear" - check out our ONLINE STORE, and compare Aqualung's new range of gear at prices cheaper than you expect, and get the highest quality gear in the world. Anyone can sell cheap gear cheap - don't be dissapointed; "buy once buy right" - from New Zealand's most trusted Dive Professionals - Dive Centre Ltd.
We are proud to be New Zealand's first Aqualung Partner Centre! We are proud supporters of the Auckland Rescue Helicopter Trust.